The following is an episode list for the crime fiction television series Columbo. After two pilot episodes, the show originally aired on NBC from 1971 to 1978 as one of the rotating programs of The NBC Mystery Movie. Columbo then aired less frequently on ABC beginning in 1989. The last installment was broadcast in 2003. Because the Columbo episodes from 1989 to 2003 aired infrequently, different DVD sets have been released around the world. In Region 2 and 4, all episodes have now been released as 10 seasons, with the 10th season covering the last 14 shows from "Columbo Goes to College" (1990) to the most recent, "Columbo Likes the Nightlife" (2003). 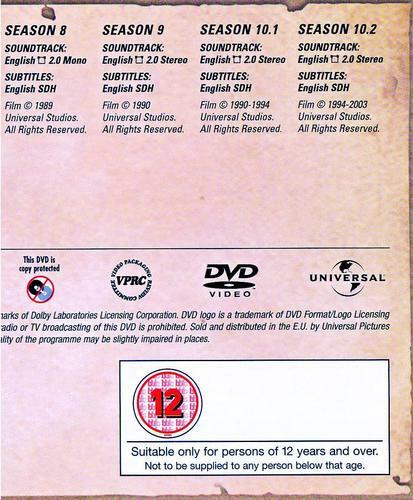 However, in France, and The Netherlands (also Region 2) the DVDs were released as 12 seasons. And in Region 1, all episodes from season 8 are grouped differently; all the episodes that are originally aired on ABC were released as the COLUMBO: The Mystery Movie Collections. For the sake of clarity, all episodes in this article are arranged as they appear in the UK release. Before Peter Falk was cast in the role of Columbo, Bert Freed played the character in "Enough Rope", a 1960 episode of The Chevy Mystery Show, a TV anthology series. In 1962, that episode became a stage play titled "Prescription: Murder" (starring Thomas Mitchell as Columbo). The play was adapted as a made-for-TV movie in 1968, with Falk debuting in the role. In this pilot episode, Columbo—rather than making the rumpled presentation that would later become the character's trademark—is less shabbily dressed, wearing suits, shorter hair, and heavier stage makeup. He carries a raincoat, which would become a staple, during some scenes. He also appears somewhat more aggressive when confronting suspects. Dr. Ray Fleming (Gene Barry), a psychiatrist, murders his wife (Nina Foch) and persuades his mistress Joan Hudson (Katherine Justice), who is an actress and one of his patients, to support his alibi by impersonating her. Final clue/twist: Knowing that he has no hard evidence against Fleming, Columbo stages the suicide of his desperate mistress. Fleming shows no sign of emotion and even suggests that if he was the murderer, he would have gotten rid of Joan anyway. Hearing this, the alive Joan testifies against Fleming. Leslie Williams (Lee Grant), a brilliant and ruthless lawyer, murders her husband Paul (Harlan Warde) to get his money, arranging the act to look as if he had been kidnapped and killed by his captors. Final clue/twist: Margaret (Patricia Mattick), who hates her stepmother Leslie, successfully works with Columbo to get Leslie to implicate herself by revealing where she is keeping the cash ransom with which she absconded. Patrick McGoohan starred in four episodes as the murderer: By Dawn's Early Light (Emmy Award) (1974), Identity Crisis (also directed) (1975), Agenda for Murder (Emmy Award) (also directed) (1990), and Ashes to Ashes (also directed) (1998). Also directed two additional episodes: "Last Salute to the Commodore" (1976) and "Murder With Too Many Notes" (2000). Jack Cassidy starred in three episodes as the murderer: Murder by the Book (1971), Publish or Perish (1974), and Now You See Him... (1976). Robert Culp starred in three episodes as the murderer: Death Lends a Hand (1971), The Most Crucial Game (1972), and Double Exposure (1973). Also appeared in one episode as the father of the murderer: Columbo Goes to College (1990). George Hamilton starred in two episodes as the murderer: A Deadly State of Mind (1975) and Caution: Murder Can Be Hazardous to Your Health (1991). William Shatner starred in two episodes as the murderer: Fade in to Murder (1976) and Butterfly in Shades of Grey (1994). Martin Landau starred in one episode in a double role as twin brothers: Double Shock (1973). ^ "Columbo - Complete Series DVD UK". Retrieved April 2, 2012. ^ "Columbo, saison 12 Fr". Retrieved April 2, 2012. ^ "COLUMBO US DVD release at Universal Studio". Retrieved April 2, 2012. Dawidziak, Mark (1989). The Columbo Phile : A Casebook. New York: Mysterious Press. ISBN 978-0-89296-984-5.